"More is better" as the current pitch line of a certain US cellular carrier says. For computers the "more" benefits are obvious for things like disk space, memory, CPU cores and network bandwidth. The same holds true in the virtual world: virtual PCs like to have more as well. I ran my test VMs using the open source Oracle VirtualBox platform under Windows 7 64-bit. The virtual hard disks were located on the same physical drive as the host OS (it was a laptop) with 12GB of host system RAM and an Intel Core i7 CPU. Each virtual machine was a freshly-installed copy of Windows Server 2012 Standard -- no other software installed and no additional server roles configured. 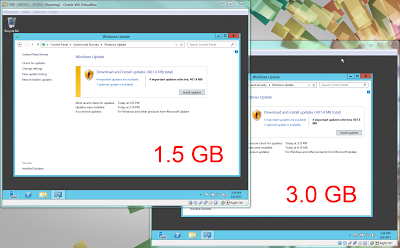 Virtual server #1 had 1.5 GB of RAM allocated while server #2 had 3.0 GB of RAM allocated. Each virtual system was loaded during the test but I paused (gotta love VMs) whichever system was not being timed at the moment. I opted to track the time of the real-world activity of installing 400MB of Windows updates. Because the downloading of updates can vary quite a bit based on network traffic I timed various milestones during the actual installations (once downloads were complete). 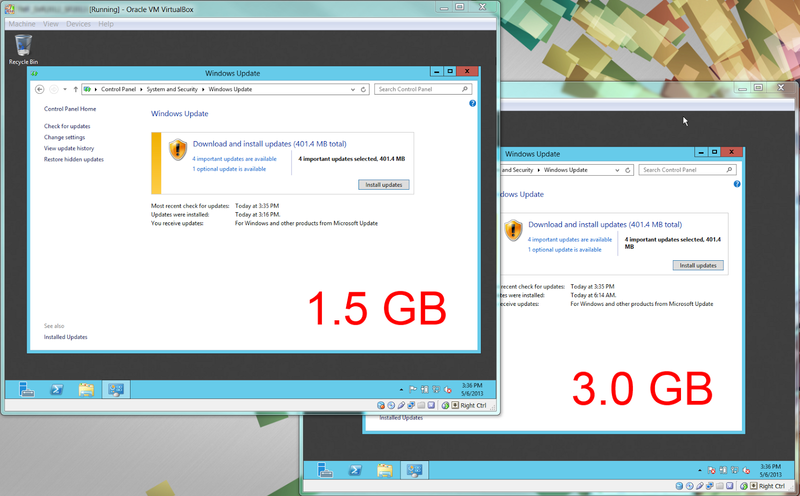 Of course the VM with 3GB of RAM was faster than the VM with 1.5GB of RAM, but how much faster? 3 minutes, 3 seconds of installation time. The download times can't be reliably compared based just on this one test (I later repeated the 3.0 GB system update and completed the download in only 11:39). The entire test including the download resulted in the 3.0 GB system finishing 8.5 minutes faster -- only 70% of the time it took for the otherwise-identical 1.5 GB system. Ignoring the download portion, the installation results pegged the 3.0 GB system at only 60% of the time needed by the 1.5 GB system for a 40% time savings. 30% to 40% faster? 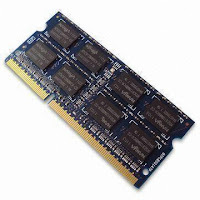 Allocate That RAM!